Buying a Gift has never been so easy! Just select the size gift Basket you want and let us mail it for you! Choose either a $50, $75 $100 or $150 gift basket. 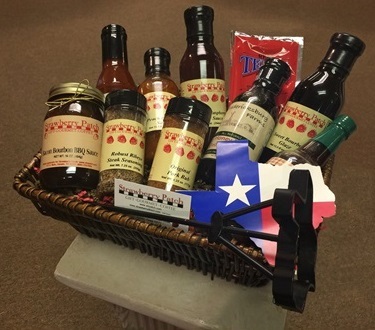 Select a basket filled with Gourmet Food from Texas, a basket with a Coffee theme, or a combination basket with a Texas Theme. Lastly, you can select a Greeting Card to fit the occasion, and we will place it in the box with the basket when we ship it (optional - add $5). We will do our best to personalize your order for you if you wish. Just let us know what we can do. You can provide us with your specific instructions in the text box provided for this purpose in the shopping cart.